You can add another address to your next Parisian fragrance tour. Roger & Gallet, the historic house still churning out Jean-Marie Farina Extra-vieille, the original Eau de Cologne, since 1862, opened a flagship store last summer a few yards from Colette on the rue Saint-Honoré. Though most Roger & Gallet products are now found in drugstores, the resolutely upbeat shop that’s got Japanese clients squealing “kawai!” offers a few rarer products, and special editions in bottles modelled after the one designed for Napoleon – who famously doused himself in Jean-Marie Farina’s Aqua Mirabilis – to carry around in his boot when he was at war. In a way, Roger & Gallet has developed a new type of sector in the market: with its well-made solinotes that don't bend over backwards to fit into the blockbuster codes, it works as a niche brand for the young (or the broke). Which makes sense since in bygone days, eau de Cologne was the sole fragrance the working class could afford. I was delighted to discover the gloriously retro Oeillet Mignardise soap in its dusty-pink wrapper – I thought it had disappeared. Nestled with other pastel-clad round soaps in a gift box tied with a colorful grosgrain ribbon, it makes for a lovely gift, every bit as tempting as a box of macarons but far less perishable. In the newer line-up, I’d pick out Dominique Ropion’s Bois d’orange, a great alternative to the Eau d’Orange Verte toiletries I get a few blocks away at Hermès (it also comes in individually-wrapped wipes). And throw in Shiso, Vetyver, Cédrat and Fleur d’Osmanthus to fill up a 6-soap box. Then of course I’d break down and keep it. The real surprise, though, came when the handsome and perfume-savvy store manager Damien pulled out two 80s gems. Roger & Gallet L’Homme is a proper chypre that anchors its sprig of spearmint in a woody-mossy base. Open looks like it popped out of a time capsule, down to its late-70s brown box and asymmetric plastic bubble cap. This is a tobacco aromatic with a hefty vetiver and patchouli base, with more than a hint of Équipage. Cheaply priced, but doesn’t smell cheap at all. Manly, yes, but I like it too, as the Irish Spring girl used to say. Launched on April 1st, the new Gingembre Rouge is signed by Alberto Morillas (who also authored last year’s Rose Imaginaire) and Amandine Marie[i] – like Yves Rocher, Roger & Gallet attracts major talent (Bois d’orange is by Dominique Ropion; Fleur de Figuier by Francus Kurkdjian). Unlike the earlier, more powerful and fairly linear Gingembre, this Zanzibar-inspired take on the theme is sheerer, which mercifully steers the juicy fruit top notes well away from jam. Throughout much of the development, the ginger hovers under a bright pomegranate accord, then warms the musk-swaddled base (“musk” being the Sevillan maestro’s middle name). Three types of ginger take the note from top to bottom. First, a lemony-sappy fresh ginger. The press material mentions a Firmenich extract of the ginger lily, hedychium zingiberaceae when its mother is angry at it. 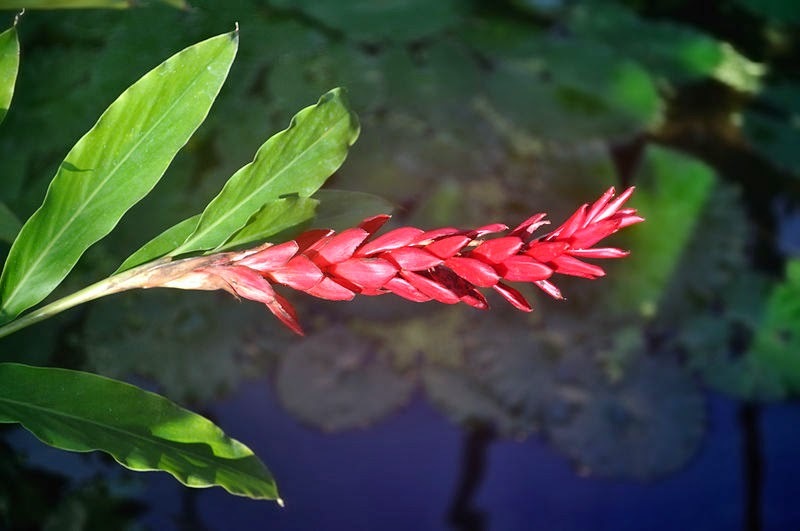 The red flower on the box, however, shows its relative in the ginger family, alpinia purpurata, a.k.a. red ginger, which gives its name to the scent). Finally, a candied ginger accord in the base. 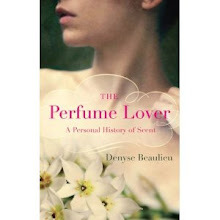 The notes list also includes mandarin, orange blossom, “lychee blossom” and cedar. Gingembre rouge is more of a scented veil than a powerhouse, but it is distinctive enough, very long-lasting and for its retail price (less than 40€ for 100 ml), a far better value than many costlier scents. Roger & Gallet, 195 rue Saint-Honoré, 75001. Damien is in on Wednesdays, Thursdays and Fridays. You can leaf through a (French) ebook of the brand’s history and drool over the glorious Lalique bottles made for Cigalia, Narkiss, Persana or Le Jade, by clicking here. [i] In the press kit, Marie lays claim to the fruity notes and explains she eschewed “old-fashioned” eugenols in favor of pink pepper; Morillas also credits her with the “crimson bouquet” that adds a “vegetal” effect in the heart notes. I love their Gingembre - delighted to hear about the Rouge one! I didn't know it well, but it does smell delicious, doesn't it? My favorite soap is bouquet imperiale (when I can find it), followed by their strange but very refreshing thé vert. I am curious about gingembre rouge! I always loved the way their soaps are wrapped. They seem very fancy and bath inviting. As for the scents, to me they look like perfect choices to wear at home, after bath, before going to bed. Those are moments that, at least to me, you don't need much sillage. I was already curious of this new red ginger, and now i'm even more! Have you tried the Osmanthus one? Could you tell me more about it? Aren't they adorable? I only smelled the Osmanthus on a mouillette and on someone -- I thought the sillage was rather iris-y. But I couldn't go much further than that. 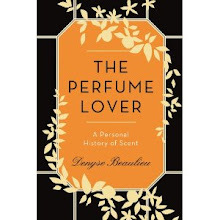 If it's iris-y, then i'll love :) I thought it'd have something of that fruity and leathery aroma of osmanthus that you see in Hermes Osmanthe Yunnan or in Parfum d'Empire Osmanthus Interdite. Too bad that i only find the perfume here, i'd like an osmanthus soap. The sandalwood and carnation are, sadly, only available in soap form (I've been keeping the carnation soap next to my computer and sniffing away!). The Lotus Bleu fragrance still exists though. They're not really re-issuing older scents, the special-edition bottles I mentioned are of the traditional Eau de Cologne, Bois d'Orange and a third one I can't remember, but it's modern. Still, it's wonderful that the old stuff survives in the soaps. I was discussing this with the R&G CEO and one of the reasons is that soap, being a rinse-off product, has less restrictions on allergens. I believe they have discontinued even the carnation soap now as I cannot find it anywhere in the United States. How frustrating! But as I answer Julie lower down, the Oeillet Mignardise soap is still sold in France, though not everywhere. Also, I am not normally jealous, but I have been coveting the peridot necklace worn by the perfumer in your last article-no wonder green is the colour of envy. I think it was just loaned to her! It must cost a kidney... I have just one pendant by that jeweller, a gift, but it was already embarrassingly costly. I would love to visit this store. It looks so bright, and I've never had a chance to try any Roger & Gallet, but I'm dying to get some of their soaps! The carnation sounds so lovely. What is the Bois D'Orange like? I've just been using the Bois d'Orange shower gel, haven't worn the fragrance. It's pretty much what it says on the label: orange on a woody base. Very enjoyable! The store is nice and bright indeed. With everything so reasonably priced, and the pretty gift boxes, it's hard not to loot it. OMG! Just this past Christmas I exchanged gifts with a friend. I bought him Chanel No. 19 soap (my absolute favourite) and he bought me Roger & Gallet Green Tea soaps... a box set of 3. I wasn't particularly impressed... but let me tell you, I was dead wrong. Does they smell like green tea? No... but they smell absolutely wonderful and they are not drying to the skin and I'm totally blown away! I don't know how much he paid for them but they're probably worth it. As for the great soap box... I'm going to store my perfume samples in it. And as for Open... I wore it for years back in the "old days". Very interesting post! I discovered Chanel No. 19 soap about 6-7 years ago and it's been my guilty pleasure ever since. What's nice about it is that it doesn't leave an overpowering scent on the skin... you can wear any perfume you want and it won't clash. And YES... Open IS glorious. That is very good to know. I get a feeling it will become my guilty pleasure as well! hello - I'm in Paris right now (May 2016) and relieved to find CARNATION (Oeillet Mignardise)Roger Gallet soap is again widely available in 5.90 euro singles (travel / plastic containers) but can't find them in 3 pack boxes - sadly... Also I can't find Magnolia or Gardenia at all (terrible !) - I am stalking chemist shops of which there are thousands here - in the hope to find those too ! Also I will visit the mother ship shop. I became emotional in a chemist when I spotted and picked up and sniffed the Carnation soap after running out of it a year ago. Phew ! Hi Julie! Yes, go to the flagship store a block away from Colette. The carnation soaps are no longer sold in three-packs, but they'll put as many as you want in a lovely box. But I very much doubt you'll find gardenia or magnolia, I've never seen those... If you get to the store and the manager is there (his name is Damien), tell him you're a reader, we've known each other for years ! Ok, so if you want to add another twist, go to the nearby Astier de Villatte (173 Rue Saint Honoré). They have an organic dishwashing liquid scented with pepper oil that can only delight a carnation lover! Since I got it, washing up is a bit less of a chore. thanks for this tip also. Will go there too - once I figure out how to fade out a sound edit on audacity app...! I recently bought three at the R&G Parisian flagship store near Colette, and the store manager didn't mention incipient discontinuation. As he told me that the vetiver soap was being discontinued, I'm confident he would've said something!